PHPCG allows to add filters to your end-user's Admin READ lists within a few clicks. You can use them to filter your list using any field of the current table. For example you can filter articles by id, title or publish date. You can use them to filter your list using any field of any related table. To create an "advanced filter" you have to build a custom SQL query to get the value you want to use in your filter dropdown list. The dropdown list label displayed in the Admin Panel. The values displayed in the option dropdown list, separated by the "+" sign. The fields used in your SELECT statement. The option value used to filter the list. The SQL FROM statement used to get the records. The index of the column in your Admin Panel READ list. 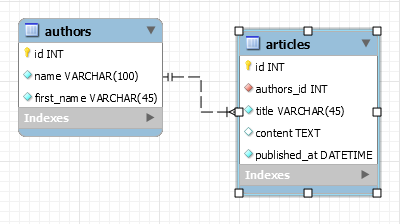 In the previous example we want to display a dropdown list with Authors names + first names to filter the articles READ list by author_id, where author_id is the foreign key.